The dangerous potential of leaping to conclusions is the backbone of Ross Watkins’ ambitious and deceptively clever debut novel for adults, The Apology. Using a cool, clear style, Watkins has created a suspenseful narrative in which the reader’s expectations are slowly chiseled away as the plot explodes anticipated versions of reality. The novel begins with a brief, untitled and anonymously voiced first page. This opening describes the titular apology and drip-feeds enough context so that, before the narrative even begins, we, as readers, have made various assumptions. The wily ambiguity of this introductory text is only evident as the plot accelerates towards the climax and the reader recognises their initial interpretations to have been dangerously simplistic. The central dilemma is quickly introduced within the following pages, setting up a brisk narrative pace that is maintained throughout. Adrian Pomeroy, an English teacher at an elite boys’ high school in Sydney, finds himself implicated in a socially devastating and potentially career-ending allegation. With his professional and personal life in turmoil and police involvement imminent, he turns to his brother Noel for help, who is a police detective in Perth. It is this embroiling of Adrian’s wider family in the drama that is key to the novel’s social reach and weight. The involvement of a broad selection of relatives allows Watkins to construct a portrait of a contemporary, working-class Australian family, then crack it open to reveal both the underlying dysfunction and thin façade of cultural obligation barely holding it together. Much of the thematic heavy-lifting undertaken by this novel is achieved through the clever interplay of structure and voice. The novel comprises six sections, with each broken into chapters voiced from the perspectives of various characters. In a similar structural style to Christos Tsiolkas’s The Slap, each character’s voice not only moves the plot forward, but more significantly, also illuminates their idiosyncratic perspective on the family dynamic and events as they unfold. Three key characters whose voices are integral to the narrative recur in every section: Adrian, Noel and Alex (the student responsible for the allegation). Through these voices, Watkins tackles a plethora of issues surrounding Australian masculinity. The only chapters not written from explicitly male perspectives are those in the voice of Wendy (Noel’s wife), Glenda (Adrian and Noel’s mother) and Nguyet (Adrian’s Vietnamese wife). Riley (Noel and Wendy’s transgender son) is also given a voice. Watkins handles the book’s marginal voices with surprising ease and a sense of authentic empathy. He has clearly undertaken significant research and his rendering of female migrant and transgender voices felt empathetic and deeply considered. All these voices work together as a diverse chorus, illustrating how masculinity is constructed and functions in a working-class Australian family. Adrian’s marriage to Nguyet is already in trouble even before the social fallout from the allegation, due to his father’s lack of acceptance of his Vietnamese wife and their son and unresolved cultural differences about family size. Noel is a character plagued by long-repressed guilt and is enmeshed in a racist, sexist and homophobic work culture. The toxic consequences of this play out in a variety of ways, detrimentally impacting both his marriage to Wendy and his relationship with their transgender teenager Riley. Noel’s frustration and pent-up emotion finds an outlet in a growing proclivity for arson. Alex (or Akker as he prefers to be called) is a conflicted teenager, vulnerable to the toxic heteronormative culture of his high school environment and struggling with his burgeoning sexual identity. Beneath this complicated façade of functional family life, there is a question being asked about the consequences of repressed guilt and whether the passage of time erodes or compounds feelings of culpability. Watkins explores this issue chiefly from a masculine stand-point, digging into the predominantly male impulse to answer physical or emotional injury with violence. Yet in the process he is also probing the nature of forgiveness and whether some harm may be beyond pardon. This is a challenging question and one that could be easily evaded in a work already addressing so many [other] problematic facets of modern Australian life. 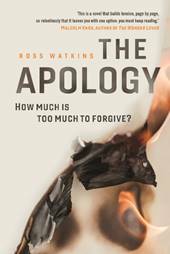 Watkins faces this final dilemma head on, breaking the concept of forgiveness away from polar opposition to vengeance or retribution, considering it instead as less a binary than a complex and long-term process. The breadth of issues addressed in this work is impressive: sexual, physical and psychological abuse, racism, sexism, homophobia, transphobia, alcoholism and dementia surround a cunningly constructed cast of characters in whose lives these issues are constantly at play. Using a clear, spare style and clever structure, Watkins has created a compelling and believable cast of individuals and a story that offers critical insights into Australian masculinity, heteronormative culture and the power dynamics at play within families. Rachael Mead is a poet, short story writer, arts critic and bookseller living in South Australia.